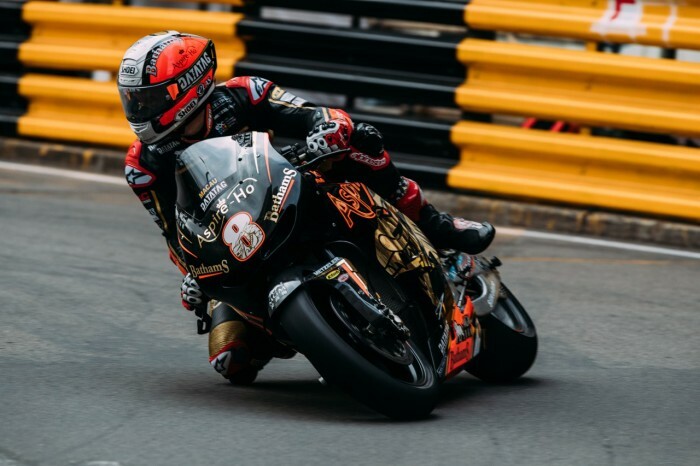 Michael Rutter admitted that while he was pleased to be on the front row for tomorrow’s Macau Grand Prix, he was disappointed in his own performance during final qualifying and that he would have liked to have been closer to Aspire-Ho by Bathams Racing team-mate Peter Hickman. The record eight-time winner has taken on a new challenge this year with the Moto-GP derived Honda RC213V-S and although he was quickest in free practice on Thursday, he’s had to play second fiddle to Hickman since, ending qualifying in second place but over a second adrift. “It was always going to be difficult coming here with a brand new bike, particularly given the limited track time we had prior to Thursday, and I’ve been on a steep learning curve but the team have worked fantastic,” said Rutter. Going for his ninth win, the Bridgnorth rider set the pace initially during final qualifying and soon got down into the 2’25s but while Hickman found a chunk of time in the final few minutes of the session, Rutter could only improve his lap time by a couple of tenths although that was still good enough for second place and the middle of the front row. “I’m pleased to be on the front row as that’s always the main thing around here given how difficult overtaking can be but I’m a bit disappointed with my own performance during qualifying. I lost a bit of concentration on my flying laps at the end of the session and whilst I’m not saying I could have matched Peter’s time, I feel like I could have been a lot closer.